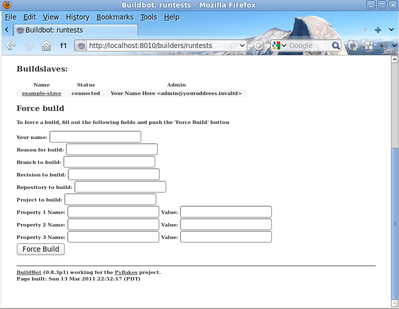 Let's start simple by looking at where you would customize the buildbot's project name and URL. # 'titleURL') and is embedded in the title of the waterfall HTML page. Now, if you go back to the waterfall page, you will see that the project's name is whatever you may have changed it to and when you click on the URL of the project name at the bottom of the page it should take you to the link you put in the configuration. This time, it's clear that there was a mistake. in the configuration. 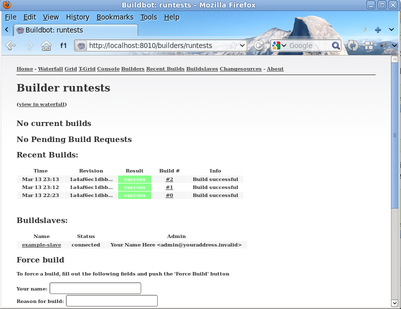 Luckily, the buildbot master will ignore the wrong configuration and keep running with the previous configuration. By now you're probably thinking: "All this time spent and still not done a single build ? What was the name of this project again ?" Click Force Build - there's no need to fill in any of the fields in this case. Next, click on view in waterfall. Now, go back to the web interface and force another build. The auth.BasicAuth() define authorized users and their passwords. You can change these or add new ones. See WebStatus for more about the WebStatus configuration. You can do some debugging by using manhole, an interactive Python shell. It exposes full access to the buildmaster's account (including the ability to modify and delete files), so it should not be enabled with a weak or easily guessable password. # change "traceTree = False" on line 185 to "traceTree = True"
This will do "git diff" for you and send the resulting patch to the server for build and test against the latest sources from Git. 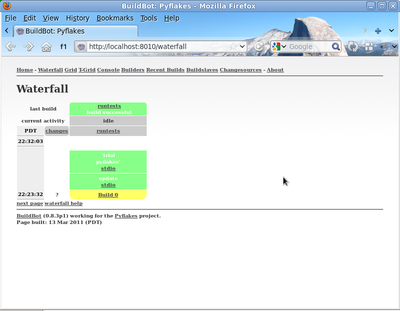 Now go back to the waterfall page, click on the runtests link, and scroll down. You should see that another build has been started with your change (and stdout for the tests should be chock-full of parse trees as a result). The "Reason" for the job will be listed as "'try' job", and the blamelist will be empty. To make yourself show up as the author of the change, use the --who=emailaddr option on 'buildbot try' to pass your email address. To make a description of the change show up, use the --properties=comment="this is a comment" option on 'buildbot try'.